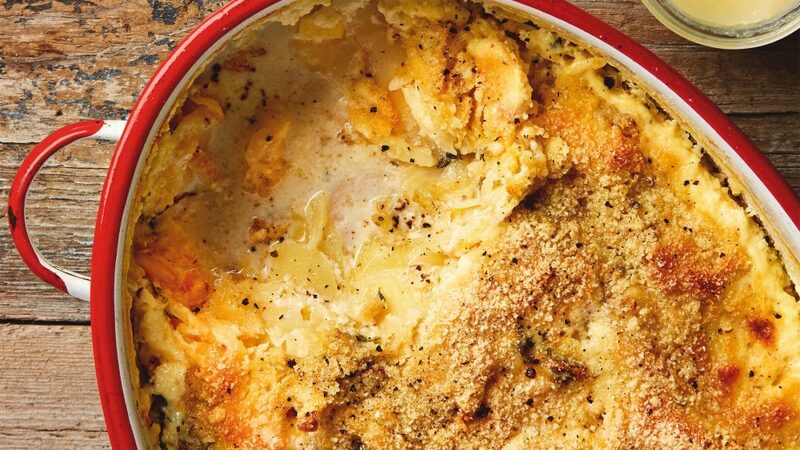 The holiday season is nearly here, so here’s another classic for the season: a creamy, chewy, appley, buttery parsnip gratin. Yum! This recipe is by Chef Thomasina Jean “Tommi” Miers, founder of the Wahaca chain of Mexican restaurants. Previously a tax consultant, a trip to Mexico changed her life, and she went on to win UK’s Masterchef competition in 2005. Flush from success, she managed to persuade a possible investor to go on a whirlwind trip with her to Mexico, where they tried several restaurants, and the rest is history. Her first restaurant opened in London in 2007, and she hasn’t looked back since, with restaurants across UK and beyond. 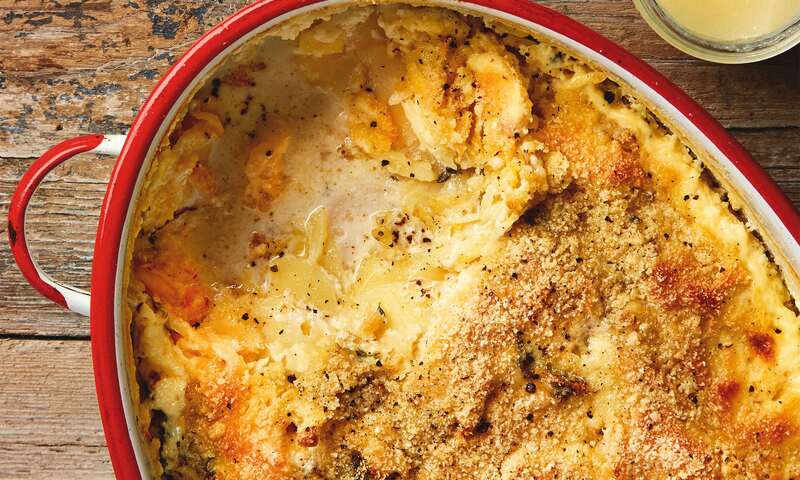 Have a favourite gratin recipe of your own? Let us know! In the meantime, you can grab all the ingredients for this–including our parsnips–at your local supermarket. Heat the oven to 200ºC/390F/gas mark 6. Thinly slice two-thirds of the peeled parsnip (use a mandoline, if you have one) and coarsely grate the rest. Rub both cut sides of the garlic around a medium-sized baking dish, then smear it all over with the butter. Arrange the parsnip slices in rows over the base of the dish, overlapping slightly. Once you’ve used up all the slices, scatter the grated parsnip on top. In a bowl, whisk the cream, creme fraiche, milk and thyme leaves, then season with a teaspoon of salt and plenty of freshly ground black pepper. Pour this over the parsnips, making sure they’re just submerged, then sprinkle the ground almonds all over the top. Drizzle with oil, cover the dish with foil and roast for 15 minutes. Remove the foil, lower the oven to 180C/350F/gas mark 4 and cook another half-hour, until the cream has been absorbed, the top is golden and the parsnips are tender. While the parsnips are roasting, make the allioli. Put the apple chunks in a small pan, cover with water and cook on a medium heat for about eight minutes, until the fruit is soft. Drain, then transfer to a food processor with the garlic and vinegar, and whizz to a puree. With the motor running, start adding the oil a drop at a time, until you’ve added about a third, then increase your speed of pouring, first to a trickle and then to a slow, steady stream, until you have used up all the oil. Season generously to taste and serve in a bowl alongside the gratin.